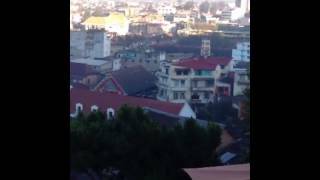 S -18° 54' 49" and E 47° 32' 10"
Antananarivo in Analamanga Region with it's 1,391,433 inhabitants is located in Madagascar. It's the capital of this country. Local time in Antananarivo is now 12:27 AM (Monday). The local timezone is named Indian / Antananarivo with an UTC offset of 3 hours. We know of 8 airports in the wider vicinity of Antananarivo. The closest airport in Madagascar is Ivato Airport in a distance of 9 mi (or 14 km), North-West. Besides the airports, there are other travel options available (check left side). There is one Unesco world heritage site nearby. It's Royal Hill of Ambohimanga in a distance of 116 mi (or 186 km), North. If you need a place to sleep, we compiled a list of available hotels close to the map centre further down the page. Depending on your travel schedule, you might want to pay a visit to some of the following locations: Andramasina, Miarinarivo, Antsirabe, Ambatondrazaka and Amparafaravola. To further explore this place, just scroll down and browse the available info. Let's start with some photos from the area. 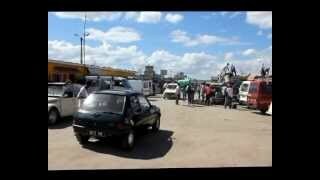 Driving Through the Streets of Antananarivo (Tana), the capital city of Madagascar. 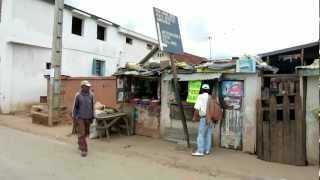 This video shows a visit to the taxi- brousse station in Antananarivo for the transport to the south (Antsirabe, Toliara, Morondava) of Madagascar. 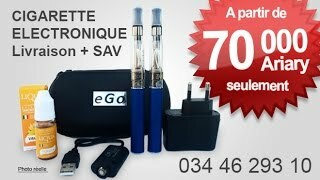 http://eyelovioo.com - Spot TV 30 secondes, campagnes publicitaires Montfleuri. Production Vidéo Digi-images. Créations, Réalisation : P. Kryl / AléoConsult. 2012. 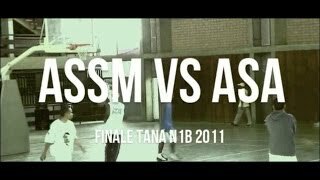 Extrait de la Finale "N1B" du championnat d'Antananarivo 2011 de Basketball qui s'est déroulé à Ankatso - Antananarivo ASA vs ASSM. 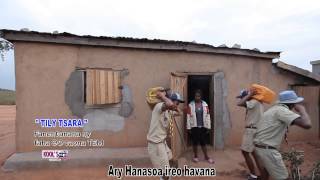 Promotional Hymn - 90th Anniversary of Scout Tily Eto Madagasikara. Evolution of built-up areas in Antananarivo, Madagascar from 2002 to 2011 on satellite images. | Vývoj zástavby v Antananarivu, Madagaskar mezi léty 2002 a 2011 podle satelitních fotografií. Antananarivo, formerly Tananarive, is the capital and largest city in Madagascar. It is also known by its French colonial shorthand form Tana. The larger urban area surrounding the city, known as Antananarivo-Renivohitra ("Antananarivo-Mother Hill" or "Antananarivo-Capital"), is the capital of Analamanga Region. Located at -18.9333, 47.5167 (Lat. / Lng. ), about 2 miles away. Stade Mahamasina is a multi-purpose stadium in Antananarivo, Madagascar. It is currently used mostly for rugby and football matches. The stadium has nearly 23,000 seats. In 2005, the stadium was the site of a stampede that killed 2 people during a match between South African side Kaizer Chiefs and Madagascar's USJF Ravinala. http://soccernet. espn. go. com/news/story?id=327093&cc=3888 It is also the stadium of the 2007 Indian Ocean Games. Located at -18.9194, 47.5257 (Lat. / Lng. ), about 1 miles away. Ivato International Airport is an airport located in Antananarivo, the capital of Madagascar. Ivato Airport is main hub for Air Madagascar. Located at -18.7969, 47.4789 (Lat. / Lng. ), about 9 miles away. 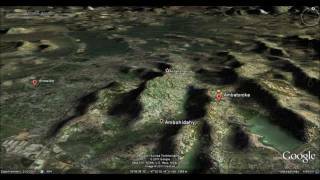 Analamanga is a region in central Madagascar, containing the capital Antananarivo and surrounding metropolitan area. The region had an estimated population of 2,811,500 in 2004. The head of the region is Pierre Manganirina Randrianarisoa. Located at -18.94, 47.52 (Lat. / Lng. ), about 2 miles away. The Rova of Antananarivo /ˈruːvə/ is a royal palace complex in Madagascar that served as the home of the sovereigns of the Kingdom of Imerina in the 17th and 18th centuries, as well as the rulers of the Kingdom of Madagascar in the 19th century. Its counterpart is the nearby fortified village of Ambohimanga, which served as the spiritual seat of the kingdom in contrast to the political significance of the Rova in the capital. Located at -18.923, 47.532 (Lat. / Lng. ), about 1 miles away. Ambatomirahavavy is a town and commune in Madagascar. It belongs to the district of Arivonimamo, which is a part of Itasy Region. The population of the commune was estimated to be approximately 11,000 in 2001 commune census. Primary and junior level secondary education are available in town. The majority 97% of the population of the commune are farmers, while an additional 2% receives their livelihood from raising livestock. Located at -18.9333, 47.3833 (Lat. / Lng. ), about 10 miles away. Ambohimandry is a town and commune in Madagascar. 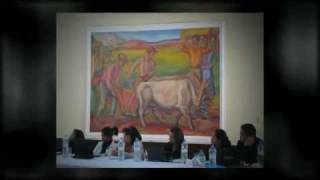 It belongs to the district of Arivonimamo, which is a part of Itasy Region in Antananarivo Province. The population of the commune was estimated to be approximately 24,000 in 2001 commune census. Primary and junior level secondary education are available in town. The majority 99% of the population of the commune are farmers. The most important crops are rice and taro, while other important agricultural products are cassava, potatoes and tomato. Located at -19.0833, 47.3667 (Lat. / Lng. ), about 16 miles away. Located at -18.8667, 47.6833 (Lat. / Lng. ), about 10 miles away. The Merina Kingdom (ca. 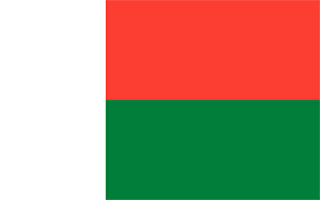 1540–1897) was a pre-colonial southeastern African state that dominated most of what is now Madagascar. It spread outward from Imerina, the central highlands region primarily inhabited by the Merina ethnic group with a spiritual capital at Ambohimanga and a political capital 24 kilometres west at Antananarivo, currently the seat of government for the modern democratic state of Madagascar. Iavoloha Palace is the official residence of the President of Madagascar. It is situated 15 km to the south from the capital Antananarivo. Located at -19.0034, 47.5286 (Lat. / Lng. ), about 6 miles away. The Ambohitsorohitra Palace is a presidential palace in the capital of Madagascar, Antananarivo. It has only a symbolic role and is not a residence of the president. Located at -18.9117, 47.5245 (Lat. / Lng. ), about 1 miles away. Tsimbazaza Zoo is a zoo and botanical garden in southern Antananarivo, Madagascar, located just north of the National Assembly of Madagascar building. The only zoo of its kind in Madagascar, on November 1989, the WWF celebrated its tenth year in Madagascar by opening an environmental teaching center at the zoo. (It is said to house "the finest collection of Madagascan wildlife", with several unique species on display. Located at -18.93, 47.5261 (Lat. / Lng. ), about 1 miles away. The Andafiavaratra Palace, located on the highest hilltop of the capital city of Antananarivo, was the residence of Prime Minister Rainilaiarivony of Madagascar, who governed the island kingdom in the late 19th century. The building currently serves as a museum and the estimated 1466 objects of historical importance to the Kingdom of Madagascar that were rescued from the 1995 fire at the Rova of Antananarivo are housed here. Located at -18.9208, 47.533 (Lat. / Lng. ), about 1 miles away. These districts belong to Antananarivo. These are districts that are close by, but belong to a different city than Antananarivo. These are some bigger and more relevant cities in the wider vivinity of Antananarivo.